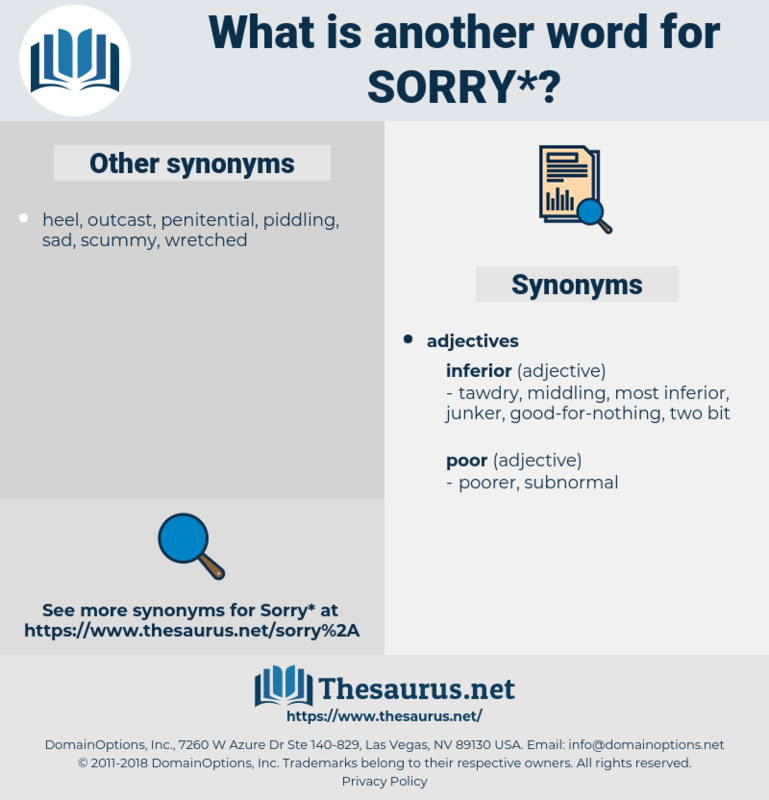 What is another word for sorry? disappointed, desolated, lamentable, deplorable, embarrassed, disappointing, distressed, sorrowful, unhappy, ashamed, saddening, depressing, upset, miserable, pitiful, pathetic, distressing, confused, sore, excusez-moi. happy, unremorseful, nice, unsorry, joyful, glad, good. inspiring, stirring, presentable, exuberant, honest, gladsome, careless, straight, lighthearted, pleasing, excited, insouciant, uplifting, unmerciful, high-minded, right-minded, righteous, perfect, easygoing, hopeful, respectable, exhilarating, satisfying, grinning, beaming, cheering, exultant, pleasant, merciless, decent, principled, bouncing, animated, enjoyable, moral, springy, pitiless, welcome, ethical, vital, gladdened, scrupulous, cavalier, bright, spirited, heartwarming, virtuous, pleasurable, cruel, Sprightful, perky, upbeat, reputable, jubilant, overjoyed, optimistic, devil-may-care, buoyant, boon, worthy, lightsome, zippy, encouraging, redoubtable, agreeable, right, ruthless, smiling, thrilled, upright, peppy, heartened, flawless, vivacious, sanguine, cheery, heartening, outstanding, delightful, rosy, carefree, compassionless, sprightly, thrilling, encouraged, Buoyed, uninspiring, unapologetic, noticeable, exulting, honorable, noteworthy, jaunty, excellent, chipper, notable, stimulating, unconcerned, rejoicing, content, energetic, happy-go-lucky, lively, valuable, unimpressive, frisky, triumphant. I'm sorry for you, and I'm sorry for the mother; but I've told you the truth - I have indeed; and you must believe me. It - ' 'Oh, I'm so sorry! shaker, shire, sharer, skier, sorrow, securer, shareware, saury, shorea, saqqara, soaker, scorer, scoria, scissor, sawyer, square away, scour, soar, shari, square, shear, saguaro, sorrower, sire, succor, saqqarah, sheer, swagger, scary, saari, souari, scar, shore, sr., sirrah, seashore, saucer, scare, shearer, sierra, saussure, sakkara, serra, serer, swaggerer, scree, sauria, scissure, shower, swearer, surrey, ssri, seizure, scurry, syria, shirer, succorer, Sauce Chausseur, seer, saussurea, saree, scarey, sour, suer, screw, share, screw eye, squire, shrew, skewer, shocker, sucre, sower, scare away, sea-ear, score, sewer, sur, succour, swayer, sear, serow, sir, showery, sure, sere, squeezer, Scry, succory, sharia, SACEUR, sore, swear, sherry, sukur, succourer, sura, surya, sugar, successor, sr, squawker, sugary, sarah, screwy, seeker, sciara, seizer, scarer, sahara, sucker, sea hare, shirr, soiree, sokoro, squeaker, secure, seeger, shariah, scourer, sari, sixer, soccer, sahuaro, scouser.